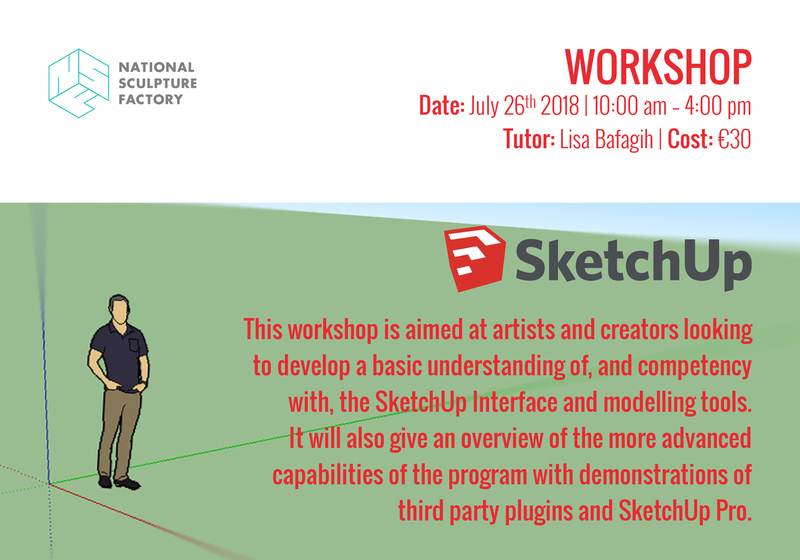 This workshop is aimed at artists and creators looking to develop a basic understanding of, and competency with, the SketchUp Interface and modelling tools. It will also give an overview of the more advanced capabilities of the program with demonstrations of third party plugins and SketchUp Pro. SketchUp Make is free entry level 3D modelling software used by architects, artists and designers to construct, manipulate, and present shapes, structures and concepts at all stages of the design process. Easy, intuitive modelling tools and techniques allow for fast concept development. A range of file import and export formats enables 2D and 3D presentation options, and compatibility with software like AutoCad, 3D Studio Max, Photoshop and many more. ● Introduction to the SketchUp interface and navigation tools. ● Best practice when using SketchUp’s modelling and modification tools. ● Basic modelling techniques using 2D and 3D modelling tools. ● Model organisation, including groups and components. ● Use of the SketchUp Warehouse. ● Section planes, cameras and 2D export formats. ● SketchUp Pro, CAD import. ● Sketchup Pro, export to Layout, scale. ● Twilight Plug -in, rendering. Lisa Bafagih’s background is in Interior Architecture. She works as an educator at St John’s College Cork, the IDAI, Dublin and BAID, London where her focus is digital processes for design. She has written and delivered online tutorials and course material in this area encompassing 2D and 3D drawing and modelling, CGI and animation techniques. She has developed and delivered workshops at UCD, and Westminster University with a focus on a multi-disciplinary approach to design software and its application. She has delivered a range of presentation work for artists, architects and designers such as Jacobs Engineering, Design Squared, Dublin, CIT, Sample Studios, Pullman Hotel Group, Bewley’s, artists Ruth Lyons and Peadar Lamb. Amongst the presentation techniques used are rendered animation, animation with sound, construction sequencing animation, CGI and Photomontage. This workshop is open to all levels of expertise but basic computer skills are essential. This workshop is part of an Art & Technology Workshop Series at the NSF for 2018 which will include workshops in Rhino – a 3D modelling programme; Blender & 3D Printing and introductory course to VR – Virtual Reality, its platforms, gear and the Unity Gaming Engine.